You may think it should be Italy giving Japan a <a href="https://inhabitat.com/londons-jellyfish-theatre-made-from-pallets-opens-today/">temporary concert hall</a> after what they've been through this year, but turns out it's the other way around. After the 6.3 Mw <a href="http://en.wikipedia.org/wiki/2009_L'Aquila_earthquake" target="_blank">L'Aquila earthquake in 2009</a>, the Japanese government wanted to give something to the city to support reconstruction. 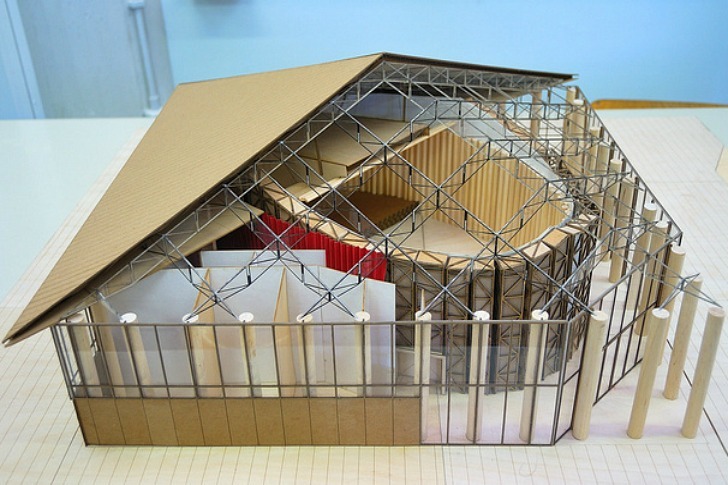 So they nominated <a href="https://inhabitat.com/tag/shigeru-ban">Shigeru Ban</a> to design and build a temporary concert hall in his well-known <a href="https://inhabitat.com/shigeru-ban-develops-modular-shelter-for-japanese-displaced-by-earthquake/">paper tube architectural style</a>. 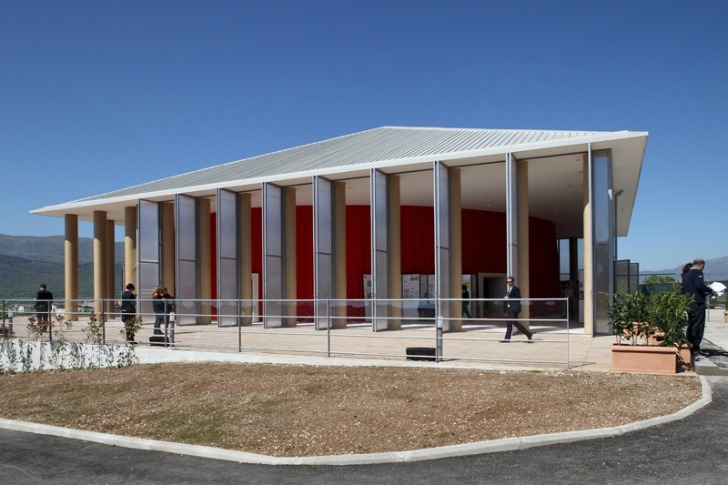 L'Aquila Temporary Concert Hall opened at the beginning of May with a concert conducted by Tomomi Nishimoto. The concert hall, built from steel, glass, cardboard, concrete and clay sacks, seats 230 people inside an oval shaped room, which is set inside another structure. 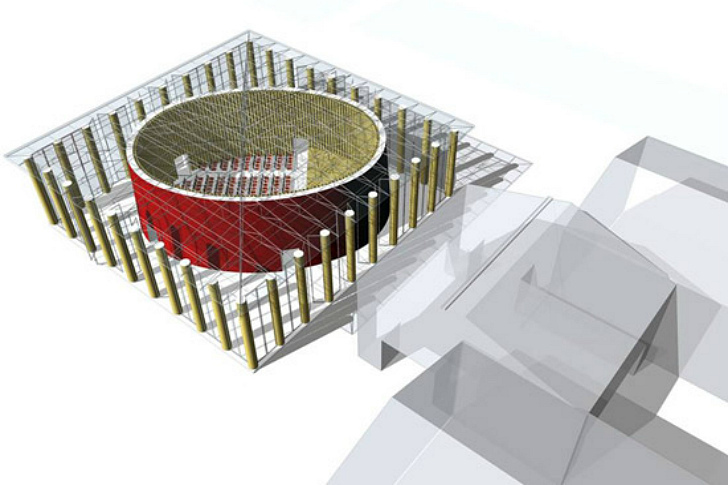 The exterior structure is square in volume with a simple pyramid roof held up by 44 pillars and enclosed with accordion doors that totally open the space up. 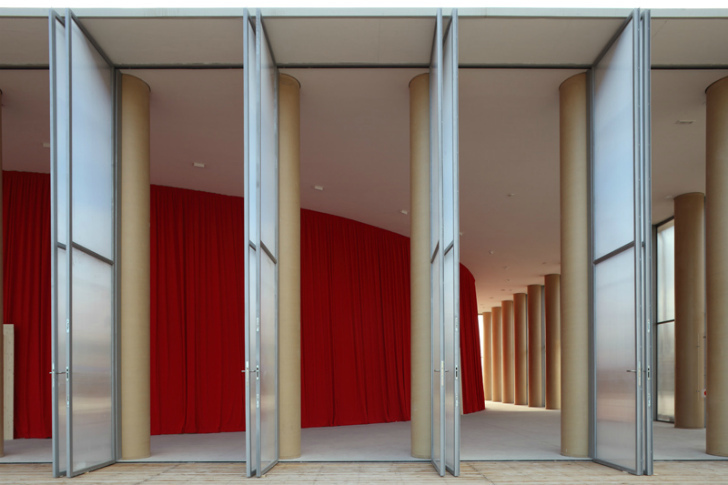 A large red curtain surrounds the inner sanctum hiding the structural supports. 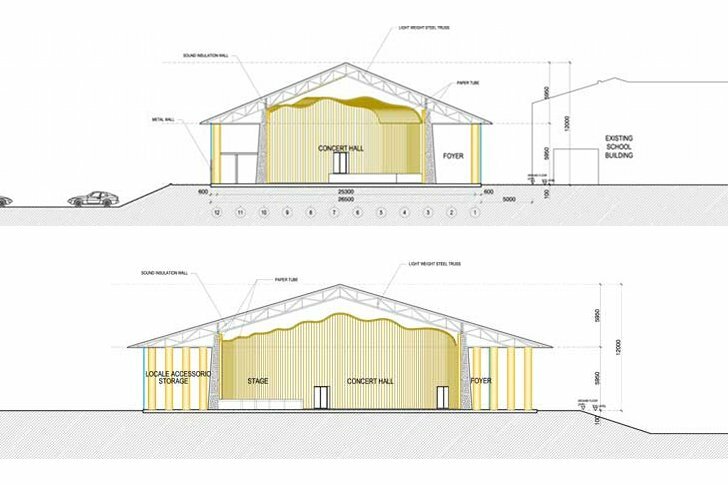 Totally temporary, the 700 sq meter concert hall can be dismantled and transported for use in another location. Ban's latest project is part of the reconstruction efforts for the Alfredo Casella Conservatory and cost about €620,000, mostly funded by Japan. Construction began on the concert hall back in 2010 and involved the help of university students from Aquila, Harvard and Keio in Japan. 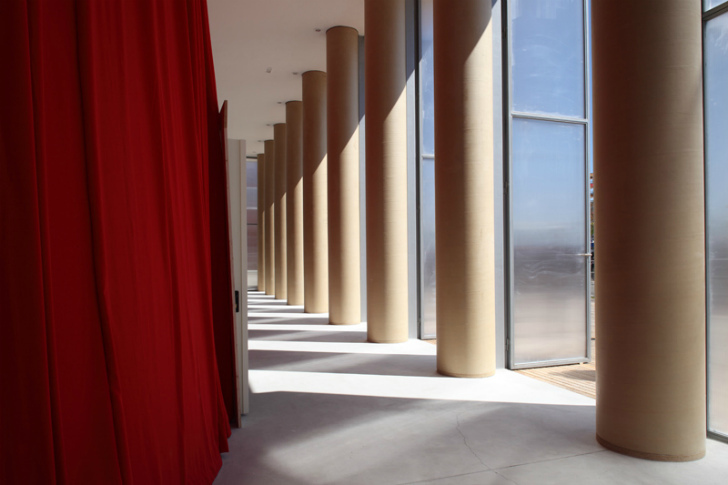 The project officially opened on May 7th succeeding in its goal of providing a concert hall, which was easy to assemble and durable, for an early resumption of musical activities in the city. You may think it should be Italy giving Japan a temporary concert hall after what they've been through this year, but turns out it's the other way around. After the 6.3 Mw L'Aquila earthquake in 2009, the Japanese government wanted to give something to the city to support reconstruction. So they nominated Shigeru Ban to design and build a temporary concert hall in his well-known paper tube architectural style. 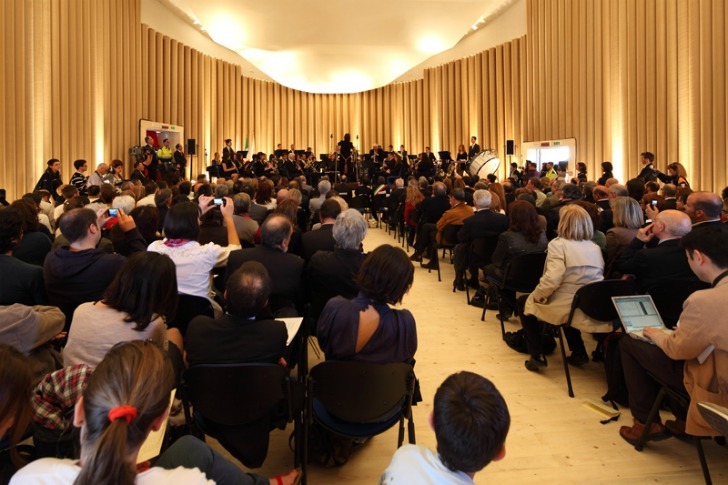 L'Aquila Temporary Concert Hall opened at the beginning of May with a concert conducted by Tomomi Nishimoto.